Comments Off on Accident—Income of minor child—Disability @50%—Income assessed as Rs.2500/- p.m.
Accident—Income—Non mentioning of income details of deceased in FIR is not a ground for ignoring a fact of income of deceased duly substantiated by adducing evidence. Comments Off on Accident—Income—Non mentioning of income details of deceased in FIR is not a ground for ignoring a fact of income of deceased duly substantiated by adducing evidence. Motor Vehicles Act, 1988, S.166-Accident~Income–Proof of—Once it has come in the evidence that deceased was permanent employee of Mill, working as Fitter Helper and official of Mill has been examined, there was no reason to ignore the aforesaid evidence—Income assessed accordingly. Comments Off on Motor Vehicles Act, 1988, S.166-Accident~Income–Proof of—Once it has come in the evidence that deceased was permanent employee of Mill, working as Fitter Helper and official of Mill has been examined, there was no reason to ignore the aforesaid evidence—Income assessed accordingly. Accident~Income~Deceased aged 36 years was working as truck driver—Supreme Court and High Court in various judgments had assessed the income of car/truck driver at Rs.6,000/-, 6,500/- and Rs.7,500/- per month respectively for the years 2004, 2008 and 2009~In present case, accident took place in 2010-Accordingly, income of deceased assessed as Rs.8,000/- per month. 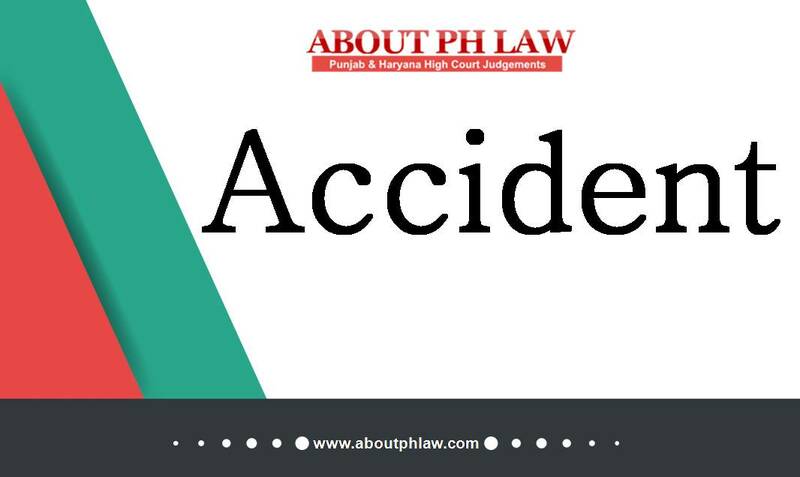 Comments Off on Accident~Income~Deceased aged 36 years was working as truck driver—Supreme Court and High Court in various judgments had assessed the income of car/truck driver at Rs.6,000/-, 6,500/- and Rs.7,500/- per month respectively for the years 2004, 2008 and 2009~In present case, accident took place in 2010-Accordingly, income of deceased assessed as Rs.8,000/- per month. Accident—Income—Deceased was a labourer having family of 7 members—Wife on oath stated her husband was earning Rs.2500/- per month-Minimum wages payable at relevant time was Rs.2116/ – per month—Keeping in view that credibility of statement of claimant has not be demolished and deceased was supporting a large family, income of deceased taken as Rs.2500/- per month. Comments Off on Accident—Income—Deceased was a labourer having family of 7 members—Wife on oath stated her husband was earning Rs.2500/- per month-Minimum wages payable at relevant time was Rs.2116/ – per month—Keeping in view that credibility of statement of claimant has not be demolished and deceased was supporting a large family, income of deceased taken as Rs.2500/- per month. Motor Vehicles Act, 1988, S.166–Accident–Income–Housewife–On the contribution as a home-maker there can neither be increase in future prospects nor any deduction. Comments Off on Motor Vehicles Act, 1988, S.166–Accident–Income–Housewife–On the contribution as a home-maker there can neither be increase in future prospects nor any deduction. Motor Vehicles Act, 1988, S. 166–Accident-Compassionate Allowance-Grant of Compassionate allowance by State Government to victim of an accident is not a ground to disallow compensation under Motor Vehicles Act. Comments Off on Motor Vehicles Act, 1988, S. 166–Accident-Compassionate Allowance-Grant of Compassionate allowance by State Government to victim of an accident is not a ground to disallow compensation under Motor Vehicles Act. Accident–income–Contention that deceased was working as a manager and was earning Rs. 20.000/- pm as proved from salary certificate-Held; No record pertaining to the receipt of salary like passbok or income tax returns was produced by the claimants—Income held to be rightly taken as Rs. 10.000/- p.m.–Compensation awarded accordingly. Comments Off on Accident–income–Contention that deceased was working as a manager and was earning Rs. 20.000/- pm as proved from salary certificate-Held; No record pertaining to the receipt of salary like passbok or income tax returns was produced by the claimants—Income held to be rightly taken as Rs. 10.000/- p.m.–Compensation awarded accordingly. Motor Vehicles Act, 1988, S.166-Accident–income–Deceased Child aged 5 years—Notional income taken as Rs. 50,000/- and multiplier of 15 applied–Total compensation of Rs.7.65 laks awarded with interest @7.5% from date of filing claim petition. Comments Off on Motor Vehicles Act, 1988, S.166-Accident–income–Deceased Child aged 5 years—Notional income taken as Rs. 50,000/- and multiplier of 15 applied–Total compensation of Rs.7.65 laks awarded with interest @7.5% from date of filing claim petition. Income–Deceased was a lady aged 42 years and was working as agricultural labourer-­ Tribunal was wrong in taking income as Rs. 25/- per day and monthly income as Rs. 650/- -Deceased was taking care of her three children and was also maintaining her husband—Taking income from the agricultural labour work at Rs. 3000/- p.m. and Rs. 1,500/- per month for the household work the monthly income of the deceased assessed at Rs. 4,500/- p.m. Comments Off on Income–Deceased was a lady aged 42 years and was working as agricultural labourer-­ Tribunal was wrong in taking income as Rs. 25/- per day and monthly income as Rs. 650/- -Deceased was taking care of her three children and was also maintaining her husband—Taking income from the agricultural labour work at Rs. 3000/- p.m. and Rs. 1,500/- per month for the household work the monthly income of the deceased assessed at Rs. 4,500/- p.m.
Tribunal permitted petitioner to withdraw the petition but without liberty to file fresh claim petition—Impugned order set aside—Liberty granted to file fresh claim petition on the same cause of action. Comments Off on Tribunal permitted petitioner to withdraw the petition but without liberty to file fresh claim petition—Impugned order set aside—Liberty granted to file fresh claim petition on the same cause of action.